In this article you will learn how you can trade mutual funds and increase returns, on top of what you already make in mutual funds. If you invest in stocks markets you should open up and look for opportunities at that time, that may bring profits fast at the level of risk you comfortable with. If you are narrow minded like, “I trade Futures so whatever happens I will trade only Futures”, Or “I trade options so I will trade only options”, Or “I trade in Nifty so I will trade only in Nifty” etc., then you will miss great opportunities to make money in stock markets. Well nothing wrong to trade only those indices that you love to trade, but it is all about making money and I believe money is money, the source is not important. 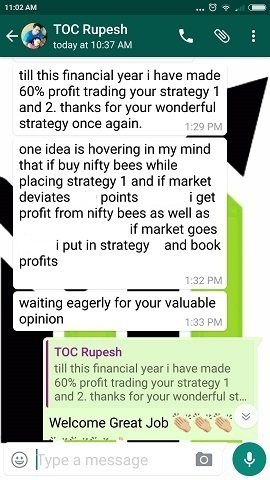 If you made a profit it does not matter from where it came – options trading, equity cash, futures, mutual funds, Nifty BeES, whatever. Similarly if you lose, it does not matter from what kind of trading you lost. You made money or you lost – the “means” has no value after the trade is done. It is the “end” that matters. This is the reason I sent an email on 4-Sep-2015 to buy ICICI bank as relative valuations were looking very attractive. The idea was to diversify risk and trade something other than options from part of the trading cash. Diversifying risk is very important especially when an opportunity is knocking at door. I also said that do not invest more than 5% of the amount in your trading account. Why I did not advice to do a bull put credit spread? 1. Markets very turbulent. It may take time to settle down. 2. Put spread will have an expiry or time limit – so that gets risky during this kind of market. 3. Risk reward favored buy and hold in that stock rather do a option trade of put spread. Remember when the markets are falling everywhere then valuations goes for a toss even in good companies. I can guarantee you this, many tips providers will have given a buy Future call on good stocks that fell because their system generated buy call (200 day moving average broken so buy etc.) – but all their subscribers lost money big time because when markets falls good and bad does not matter. When a good stock falls it looks like it won’t fall further and people do the mistake of buying Futures and unfortunately end up with losses. And here is the worst part – when it falls they average it out by buying one more lot. If it does not recover just one trade is enough to take out a couple of lakhs from your account. You wanted to make money fast – now pay. At least put spread is better as it is a limited loss strategy. But like I said – a loss is a loss and we all hate taking loss, isn’t it? Therefore I advised you to buy the stock and hold. Even if it makes 10% in 6 months (256+10% = 282) that is a return of 20% in one year, and in my books and that is much better return than making a loss. A late profit is much better than a quick loss. On Friday 4th of September, 2015 Indian Stock Markets gave us an excellent opportunity to trade. 1) Nifty was at around 7600 which is 15.50% lower than its March 2015 high of 9000. 2) Some some blue-chip stocks were down by 20-30% than their recent high. 3) All equity mutual funds were also down by 20-30%. 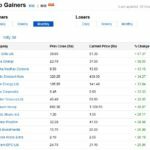 ICICI Bank of course was bought, but then I thought that it was not enough as I have significant exposure to mutual funds as well – why leave a great opportunity to make money from them as well. I am sure you being an option trader know about the two kinds of Mutual Funds – The Equity Funds (that invests in stocks of companies) and The Debt Funds (that invests in corporate and government bonds, and other fixed income securities). The best way to make money from mutual funds to invest in 3-4 good equity mutual funds via the SIP (systematic investment plans) route. You decide how much you can invest per month and how much you want to invest in each of the mutual funds and sign the SIP form. That’s it on investment day the money gets out of your bank account and gets invested in mutual fund. You don’t have to do anything. Its all automatic. With time the fund grows big and returns gets compounded and after a few years if the markets and the fund performs you can exit with a lot of money without paying any taxes. I offer a course on choosing the best mutual funds to invest. You can read about the course here. Most people use mutual fund investments to plan for their retirement which is a very good thing to do. If you are still not investing, I highly recommend you start investing in them as soon as possible. This course will help you to retire rich with crores. Now this is a very simple way to make money from mutual funds. However you can try to actively manage “a part” of your mutual fund portfolio as well. When I say a part it means that here too risk management takes precedence. If you start actively trading the full amount in mutual funds then you will end up making a mess and probably lose money. To actively trade mutual funds you must have an online account to manage your mutual funds. Otherwise it gets very difficult to manage them. Signing physical forms and depositing them in the funds house is very tedious and time consuming job and hence not recommended. If you do not have an online account for your mutual funds its highly recommend that you open an online account. Instead of Fixed Deposits, I keep extra money in liquid or debt mutual funds. For one they are tax efficient and two, they give slightly better returns than bank fixed deposits. And three, they help me to trade funds as well. My wife makes some money every-month by doing freelancing work and she only does one thing – Fixed Deposits in nationalized banks. Well I am not against it as I consider her better than 95% of traders who lose money trading. 🙂 And it also helps us to diversify risk on our combined portfolio. The simple investment via SIP is going in some funds as usual. People who have taken my course know that I hate trading options on cash – its a leveraged product so why trade on cash? 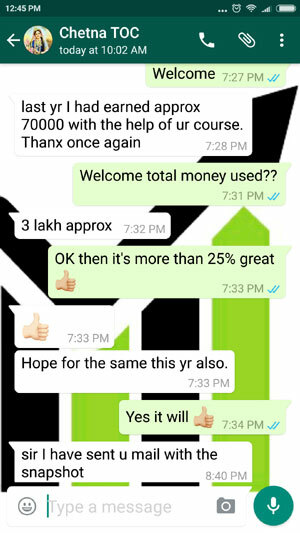 You should always trade on collateral against shares, not cash – therefore I give the stock option trade in my course. So the story is I am held up in ICICI Bank – on 4th September 2015, I bought more – when rally comes the returns are going to be amazing. Obviously if Nifty is down, these large companies are down as well. Which means when Nifty goes up these large companies will also go up. That also means the rise is going to bring most profits to large cap mutual funds rather than small or a mid-cap funds. Well they will also gain – some more than large caps – but here we are taking a calculated risk – not a speculation. So I had to select a large cap fund. Instead of doing FDs, I park extra cash in liquid funds. This invest well course will help you to chose the best liquid or debt funds. Now comes the part on how to trade mutual funds. It is very important that your risk is diversified. Some of your savings must go into liquid funds and some in equity funds. If you are keeping all money in only a single fund you are doing a mistake. I have said this earlier. Proper Risk Management Is Very Important. How to properly diversify your risk in Fixed Deposits, Mutual Finds and Stocks is described well in my how to invest well and retire rich course. With liquid funds you can decide how much you want to withdraw. In a FD you will have to close the whole account, that’s another benefit of liquid funds. A lot of traders do this mistake of jumping the next big opportunity full force with ALL the cash they can bring to the table. This is a huge mistake. If that trade fails you lose a lot of money. Therefore Risk Management is VERY Important. You should take a calculated risk with a calculated amount of money – BOTH are important. Will Proper Risk Management Work Every time? No. But overall the results over long term 5-10 years will be better than not managing the risk. I keep booking profits at regular intervals in equity mutual funds, just like people do in stocks. But not every equity mutual find performs well. It is just 10% of equity mutual funds that perform better than Nifty. Therefore if you want to trade equity mutual funds well it is very important you choose the right equity mutual fund. My invest well course will help you to choose the top mutual funds to get great returns over years. 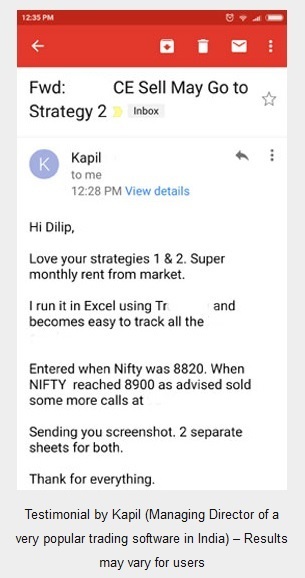 I keep booking profits if Nifty kept rallying. Overall my portfolio is doing well. There was a time I had no idea to choose good funds and even if there was a rally, my mutual fund portfolio did not perform well. I used to be sad. But no more. I know if a rally comes I will be in good profit. While trading funds, SIP investment is important, because if you try to time the markets with all your money you will be proved wrong over time – but if you do SIP its a calculated risk – you will see that it is working. And if there is a sudden rally, you still participate. Does This Opportunity Come Every Year? Yes almost every year. A 10% fall is common, and a 10% rise too. If you cannot identify stocks to buy or if you cannot identify good mutual funds to invest you can do my course. It costs less than what you miss in a small rally every year. Over a period of 10 years imagine the kind of wealth you can create if you invest in good stocks and mutual funds. Why Not Invest ALL Money in Equity Mutual Funds, Why Liquid Funds? Pretty bad idea really. There is some cash that you may require urgently, may be tomorrow – who knows. Since the stock markets are highly volatile – the equity funds may be in the negative when you need funds and you may have to book loss to redeem your money. This urgently needed cash should be kept in liquid funds rather than your bank savings account. With time it will grow. If you really want to make money from stock markets then you have to broaden your way of thinking. Keeping all your eggs in one basket is a bad idea. The day the basket falls you may lose a lot of money. In fact even in options trading if I see a better opportunity and I don’t have cash, I close a few lots of my current trade to free cash and get into a better looking trade. Since all my trades are always hedged I can close them at my will with a small profit or loss and get into a better trade. I do the same with stocks and mutual funds. This is how I trade stocks, mutual funds and options & futures. My portfolio is well divided and the risk is well managed. I am not worried if there is a great fall in stock markets. If you open up there are a lot of opportunities to make money from the stock investing, mutual funds, option & future trading. 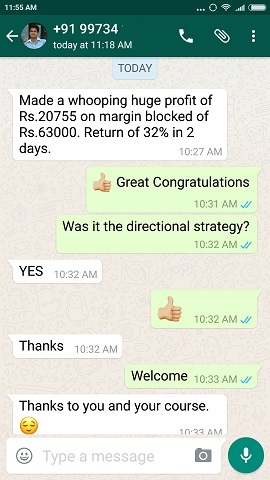 Very very knowledgefull information sir I sincerely thank you I wish I will be continue in touch with you I hope with your guidance I will be able to debt free by making profit from the stock market. Shankar, if you know what you are doing and the plan is not too risky and well managed, then frankly there is no confusion. Thanks for the kind words Ragunathan. Good that you invested. These opportunities should not be let go. See how Nifty is already up from 7600. If it does not go back the opportunity is missed. That is why you should jump in with a calculated risk. In a bluechip fund and diversified equity fund each 25% out of my total trading cash… Again i would like to invest in a debt fund…is it a good idea to invest in ultra short term funds? If you want to park it for more than 2 years then I suggest go for debt income funds. They make slightly more than short term funds. Else if you want to keep for less than 2 years – liquid or ultra short term funds are good choices. Now I’m planning to invest in liquid fund, question is, there are so many liquid funds out there in Franklin Templeton fund house to choose, which one to choose, are these different from each other? I also see something called redemption price, is this nothing but exit load? Yes in any fund house you will find a lot of funds – but you should chose a fund that has a great track record of 3-5 years. Anything below that please reject. Redemption price is same as exit load. I cannot share stock ideas as no one can ever know how far a stock may go up or down. So if I publicly announce then visitors to this site start buying those shares. Another Gem! Loved reading it. The day i started reading your post i got more educated towards stock markets. Thanks Vivekanand. Nice to know you wait for my posts. Thanks again. Thanks Nizar. This you can research yourself in top mutual funds sites of India.